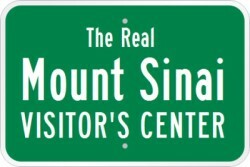 RealMountSinai.com is your Visitor's Center, your first stop on your journey to explore the historical and archaeological information available on the Biblical Exodus and the Real Mount Sinai in Saudi Arabia. As you will discover the Real Mount Sinai is in the Jabal al-Lawz Mountain range, in the ancient land of Midian, located in the far north-west corner of Saudi Arabia, only 130km or 80 miles east of the traditional site at Saint Catherine in the Egyptian Sinai Peninsula. This places the Exodus of the Hebrews going "out of Egypt" and the Wandering in the Wilderness in the current land of Saudi Arabia. The Real Mount Sinai is locally called Jabal Maqla (the Burned Mountain) and Mount Horeb is called Jabal al-Lawz (the Mountain of Almonds), which is the highest mountain in the area of Al Bad, Saudi Arabia. This year and last year (2018) have been an explosive years in developments on the Exploration of the Exodus and Real Mount Sinai in Saudi Arabia. This new website re-design is bringing together all the people, ministries, documentation, and video in one place. Use it as your first stop to enhance your exploration skills in locating and identifying a comprehensive list of key historic and archaeological finds in the area. We began developing an Interactive Exodus Map to help you get your bearings, an overview of the archaeological discoveries and were in relation they are to each other. We encourage you to send us your questions, comments, and suggestions here as we continue to expand the resources on this website. RealMountSinai.com is contributed to by those who have first hand working experience with the body of evidence surrounding the Exodus in Saudi Arabia. Having an inside track to many more details than are publicly available gives us a perspective to be able to highlighting the best of the best of publicly available research, videos, products, and materials. David Rohl's New Egyptian Chronology places the Exodus at 1446 BC with stunning accuracy. Ryan Maruo's Documentary: "Mountain of Moses" (included in the Introductory Videos above). Ryan Maruo's Timeline, Historical Accounts of Sinai in Arabia. Joel Richardson's New Book: "Mount Sinai in Arabia" [download free] Purchase on Amazon.com. Patterns of Evidence: The Moses Controversy - Feature Film completed its debut March 14, 16, and 19 across movie theaters in the United States. See more information, videos, and interviews on our page: Exodus Media (Film,TV, Docu). AVAILABLE NOW: Purchase on DVD at Amazon.com (also Director's Edition). Watch Online at YouTube, Amazon Prime, iTunes, Vimeo, Christian Cinema.